When we say Batchoy, the first thing that comes to mind is the La Paz batchoy from Iloilo, it’s a noodle soup with chicharon, with miki noodles, egg and broth. 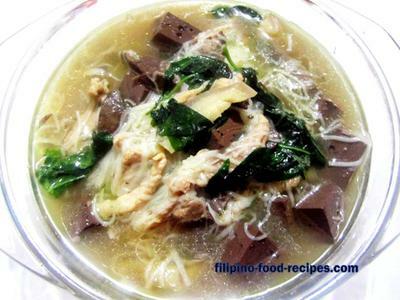 However, this Batchoy Tagalog recipe is more like the Chicken Tinola soup in terms of cooking procedure, taste and aroma. It’s basically a soup dish made up of porkloin, liver and kidney, sautéed in onion, garlic & ginger and of course the star of this recipe, the solid cubed blood which can either from pork or cow. Misua noodle is added instead of the miki noodles and we put chili leaves, just like in of the Tinola. 1. Saute garlic, onion & ginger. 2. Add the pork lomo & cook until slightly brown. 3. Add in patis & and water and bring to a boil. 4. Turn the heat down and let it simmer until the meat is tender. 5. Add the liver, pork lapay & cubed blood then simmer for 5 minutes. 6. Mix in the misua. 8. Lastly, put the sili leaves and serve hot.